Texas already harvests more wind power than any state in the nation, bringing the promise of clean energy to millions of homes and businesses. Trouble is, getting that power from remote, windy West Texas to the big cities requires a massive, $5 billion network of transmission lines — which property owners in the Hill County and elsewhere don't want in their back yards. As construction gets under way on the new lines, an army of lawyers and angry landowners is working to stymie the state's renewable energy plans. Part one of a three-part series. This is the first part in a three-part series examining Texas' $5 billion build-out of transmission lines to support wind power, which is encountering increasing opposition. Last week, to cheers from a crowded courtroom, commissioners in Denton County unanimously passed a resolution opposing the construction of a big new transmission line through their county — even though it would carry clean, renewable wind power. Later today, the company that wants to build the line will file a stack of paperwork refuting some of the objections and asking Texas regulators for permission to proceed anyway. It's the latest episode in the marathon drama known as CREZ (short for Competitive Renewable Energy Zones), the state's two-year-old plan for building a $5 billion transmission network to support the pell-mell development of wind farms in West Texas. Regulators already have approved eight new routes, with construction on some to begin this fall. Nearly two dozen more are in the pipeline, including the Denton County line. "It's fast and furious," says Lambeth Townsend, an attorney with Lloyd Gosselink, an Austin-based law firm. Townsend represents Denton County landowners who fear that big, ugly wires will end up going through their property or a scenic area called the Greenbelt. The state's Public Utility Commission, or PUC, approved the CREZ concept in 2008 in response to a directive from the Legislature in 2005. The plan calls for erecting a network of transmission lines — spanning more than 2,300 miles — to bring the wind power generated atop remote western mesas to cities in the Central and East Texas, where most of the population lives. The network has earned praise for its efficient planning from renewable energy advocates around the country. Trouble is, between the windy plains and the cities demanding power lie many people who fear that their scenery will be despoiled. So the proposed transmission network has unleashed an army of lawyers and angry landowners, who do not want the power lines and tall lattice towers cutting a 160-foot-wide swath through their acres. The epicenter of opposition is the Hill Country, where many fear the ruin of the exquisite vistas that first lured wealthy landowners there. The fierce protests have gotten the attention of the PUC, which oversees the transmission-line build-out. In April, the commission rejected the routes proposed by the Lower Colorado River Authority along one Hill Country line and could dispense with the segment entirely. But the opposition has spread to other places, as the Denton County uproar shows. The line, to be built by Dallas-based Oncor, would run north of Dallas-Fort Worth, from West Krum in Denton County to Anna in Collin County, and could pass through the Greenbelt. "It's a big, emotional impact," says Townsend, who once served as general counsel for the PUC. He noted that the lines may cut through land where people have planned their dream retirement homes. When Oncor files its application for that line segment today, it will sketch out a number of possible routes to get from West Krum to Anna (and it will include alternatives to going through the Greenbelt). Once that happens, the commission will have 180 days to decide which of those route options to approve (or whether to approve the line at all). It is a process that, as with all CREZ lines, involves hearings (generally in Austin) to determine where exactly the line will go. In addition to the West Krum-Anna line, two other applications will be filed today. Applications for another seven lines are expected by mid-November, and two more projects, running from McCamey to Odessa, do not have a fixed filing date. Twelve applications are currently on file with regulators. The CREZ lines can carry all types of power — potentially including power from several coal, gas and even large solar plants that, according to the state grid operator, the Electric Reliability Council of Texas, are under consideration in West Texas. But Texas' rapid rise to wind-power dominance drives the demand for the lines. The state currently has nearly three times as many turbines as the next-closest state, Iowa. But most wind farms are in breezy West Texas, whereas the population centers are in the center and the east. According to Greg Wortham, the mayor of Sweetwater and a strong wind advocate, only one major line connects West Texas to the big cities, creating a bottleneck. As a result, many wind turbines can't pump power into the grid when the wind blows hardest — typically at night. Those that do sometimes get paid "negative prices" on the market (technically, the wind farms pay the power companies to take the power, though they recoup small operating profits through a federal tax credit). So some wind farms are on hold until the lines get built. More transmission lines would allow these farms to funnel their power to the big cities like Dallas or Austin, where officials and customers clamor for more green energy. For the first time, big transmission lines linked to the Texas grid will also reach deep into the Texas Panhandle — the windiest part of the state, but one with relatively few wind farms. Oncor hopes to build 850 miles of lines — the most of the 13 companies with similar plans. The company will begin construction in West Texas on some lines this fall. The Lower Colorado River Authority says construction for the first of its lines, from Tom Green County to Schleicher County, should begin in fall 2011. Both Oncor and LCRA have completed a few CREZ lines that run along existing rights-of-way, which already had wires but needed an upgrade. So far, the PUC has approved eight new lines, meaning that their route, including whose land will be affected, has been determined. After the PUC approves one of the routes, the transmission company then negotiates with the landowners, offering them a one-time sum of money for an easement and discussing the particulars of the path — whether a line should run along a fence, or through a field, and so on. If those negotiations fall through, the company can use powers of eminent domain to take the land. Nine times out of 10, however, eminent domain is not needed, according to Catherine Cuellar, an Oncor spokeswoman, who cited the utility's experience with other transmission lines. 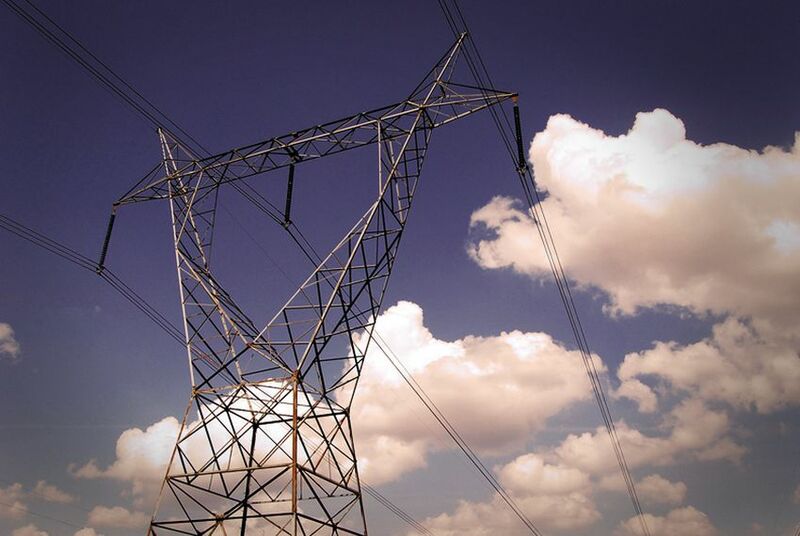 Eventually, the transmission companies will recoup their costs from ratepayers. If the $4.93 billion original cost estimate for the entire network holds true — impossible to know at this point — that would average out to more than $650 per meter in the Texas grid system, according to the PUC. Terry Hadley, a PUC spokesman, notes that commercial customers will pay substantially more. Residential ratepayers can expect to see a $3 to $5 monthly charge on their bills, for a decade or so, to pay for the infrastructure. However, the PUC will need to approve the new charges — a process that could begin in a year or more. But all this depends on soothing landowners who act as gatekeepers to the state's major electricity markets. The difficulty is far more widespread than Texas. "The ability to site and build transmission is emerging as one of the highest risks facing the electric industry over the next ten years," says a recent report from the North American Electric Reliability Council. President Obama has called for 3,000 miles of new transmission lines to be built to support renewables. The Texas system has inspired similar transmission line projects around the country, including in California. But Texas has a big leg up on other states: its own stand-alone power grid. The other 47 of the lower 48 states are part of either the east grid or the west grid. In theory, that means Texas can navigate the regulatory maze much faster, having no need to consult with other states or federal authorities. But even here — in a state long accustomed to infrastructure supporting prolific energy production — the transmission lines must cut through a distinctly Texan reverence for property rights.